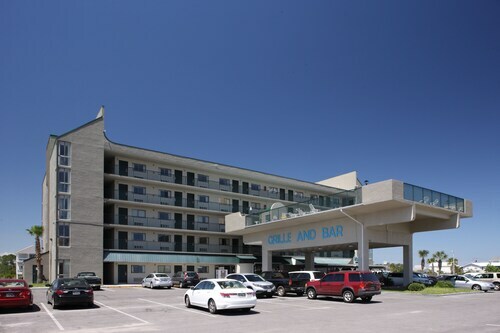 Located in Orange Beach, this beachfront hotel is in the city center, 2.6 mi (4.2 km) from Orange Beach Indian and Sea Museum, and 2.7 mi (4.4 km) from Adventure Island. Perdido Key State Park and Orange Beach Art Center are also within 6 mi (10 km). 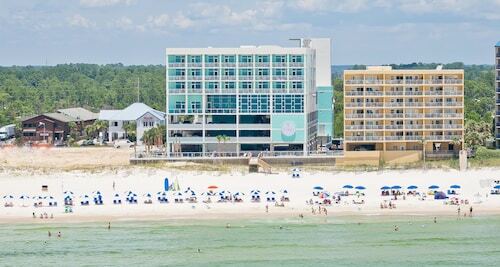 Nestled on the beach, this Orange Beach hotel is within 3 mi (5 km) of Orange Beach Indian and Sea Museum, Adventure Island, and Orange Beach Art Center. Orange Beach Welcome Center is 2.5 mi (4 km) away. 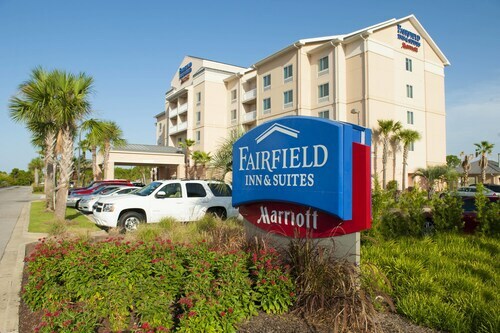 Situated near the beach, this hotel is within 3 mi (5 km) of Gulf Shores Beach, Alabama Gulf Coast Zoo, and Gulf State Park. Waterville USA and Zooland Mini Golf are also within 2 mi (3 km). You’ll enjoy captivating panoramic views of emerald green waters and miles upon miles of sugar white sand on Alabama’s famous Gulf Shore. Nestled on the beach, this Orange Beach hotel is within 3 mi (5 km) of Orange Beach Indian and Sea Museum, Adventure Island, and Orange Beach Art Center. The Wharf and Gulf State Park Fishing Pier are also within 6 mi (10 km). 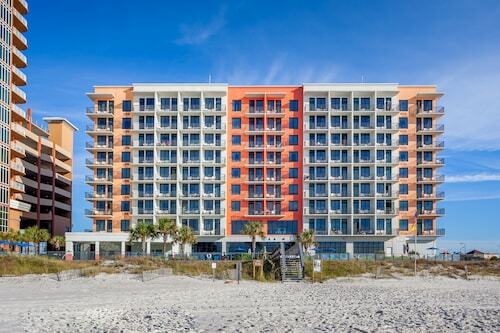 Nestled on the beach, this Orange Beach hotel is within 3 mi (5 km) of Adventure Island and Orange Beach Art Center. Gulf State Park Fishing Pier and The Wharf are also within 6 mi (10 km). Nestled on the beach, this Gulf Shores hotel is within 1 mi (2 km) of Gulf Adventure Center at Gulf State Park and Gulf Shores Beach. Alabama Gulf Coast Zoo and Gulf State Park are also within 3 mi (5 km). 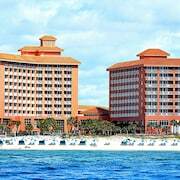 Situated near the beach, this resort is within 2 mi (3 km) of Adventure Island, Orange Beach Indian and Sea Museum, and Orange Beach Welcome Center. Orange Beach Art Center is 2.5 mi (4.1 km) away. What is Gulf Shores known for? What is the best beach in Gulf Shores, AL? Gulf Shores is lined with beaches. In fact, the city limits on the entire south side of the city is coastline. You could say that the city is actually just one big beach, but everyone in town has their own favorite place to play in the waves. If you prefer to brave the waves from the captain’s seat, then float on over to Little Lagoon, which may be aptly named, but it is lined with docks and boats to charter in the deep blue water. Whether you stay on the lagoon or near your favorite seafood shack, one of our Gulf Shores hotels on the beach is sure to make you feel at home. With Travelocity’s price-matching guarantee, we’ll match the best deal available. Relax from the moment you start perusing our breezy accommodation options, including Lighthouse by Wyndham Vacation Rentals. When you’re looking for a cure from the workaday life and a big beach city doesn’t quite have the salt water to charm ratio you seek. 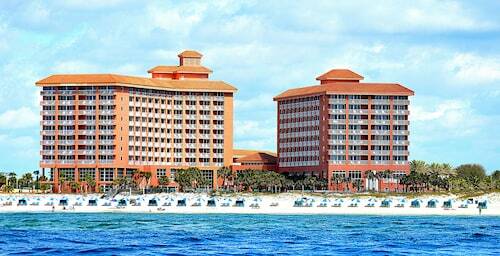 I loved the free breakfast, the rooms were very nice, & it was the perfect location on the beach. I really enjoyed the breakfast area overlooking the beach. The only complaints I have are that the elevator was a little slow, and the room doors were heavy. Other than that, everything was great! Will definitely be returning! The outside entrance was dirty and the trash can was over flowing the whole time we were there. Front lobby had air condintion units stacked on the floor right as you entered the front lobby. The view from lobby is amazing! Very open and inviting. However the room could use some attention. The bed was comfortable but the room had some damage and bedding some painting touchuos. The shower nozzle would only allow scalding hot water or freezing cold, it wouldn’t stay in the medium position. So showering was a trick. 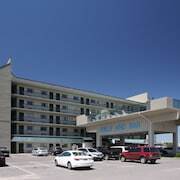 Overall, I would stay again the staff was extremely helpful and nice. I think it is a little overpriced for the conditions. Only stayed one night. Overall stay was pleasant. If you like soft mattresses then this hotel is for you. Rooms and beds are small but nicely appointed. Breakfast was decent. Lots of obvious options for a hotel that offers free breakfast. Hotel was full and still had seating to eat. Would definitely stay again but wouod re-evaluate one or two rooms as my children get older.